The famous Western Shrines of Kandy Gadaladeniya, Lankathilake Buddhist temples and Embakke Hindu-Buddhist shrine are connected by a very scenic footpath. 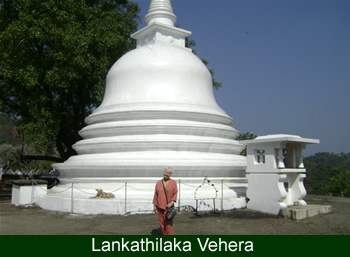 Gadaladeniya in north close to Colombo - Kandy highway, Embakke is in the south and Lankathilake in the center of the trek. 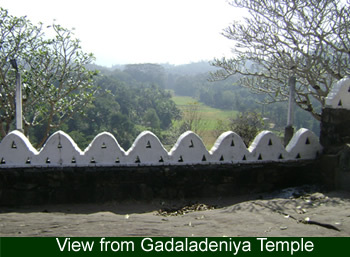 All the three temples were constructed by the kings during the period of pre Kandyan kingdom of Gampola in 13 century A.D.
Gadaladeniya Temple's design is of South Indian origin with a Devale (Hindu shrine) attached to it, similar in character to the Natha Devale and Gedige of Adahana Maluwa in Kandy. The main shrine room has a seated Buddha statue and the remains of some paintings of the Gampola period. 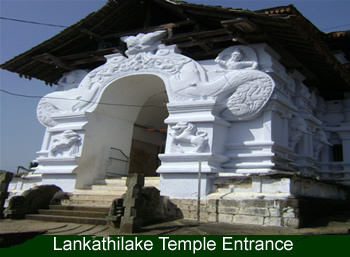 The Lankatilaka Temple is considered to be one of the best preserved examples of traditional Singhalese temple architecture. Built on a rock, the temple is reached by a long series of rock cut steps. An arched passage of the image house leads through a Mandapa (hall) into the inner sanctum which is richly decorated with beautiful floral designs. The two side walls and the ceiling are decorated with paintings. In the inner sanctum is a colossal seated image of the Buddha. 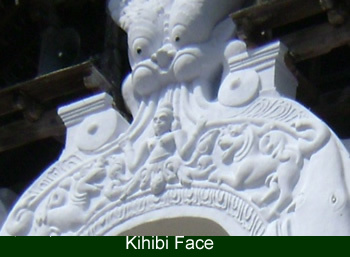 Embakke is a Hindu shrine dedicated to god Skanda (Kathragama) It is with the masterpiece of wood carving available in Sri Lanka. The roof of the hall is special because of the rare architectural techniques, shape like a talipot leaf. 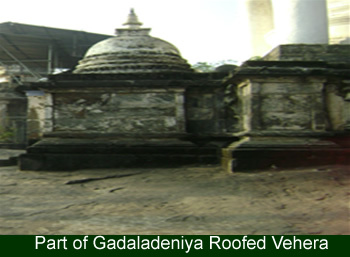 The walking can be started from Gadaladeniya temple or Embakke both sides. From a small town near Embakke start walk passing rice fields with birds. 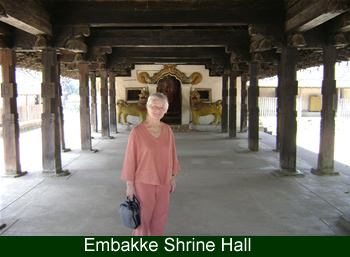 Visit Embakke shrine and passing a muslim village, singhalease traditional village with Kenyan home garden, tea plantation to Lankathilake temple. Visit temple and pass down on rock cut steps to rice fields dam and gravel road to the Gadaladeniya temple with bird watching looking other animals like water snakes and lizards. Traditional brass were factories on the way.